HÀ NỘI — Việt Nam and Slovakia need to hold more trade exchanges, increase multi-channel information dissemination and encourage businesses to establish representative offices in each country, according to participants of the Việt Nam-Slovakia enterprises’ forum. The event, held yesterday in Hà Nội, was organised by the Việt Nam Chamber of Commerce and Industry and the Slovak Investment and Trade Development Agency. According to Việt Nam’s Ministry of Industry and Commerce, two-way trade between the two countries has jumped 40 times compared to 2004. Last year’s bilateral turnover increased by 52 per cent compared to 2015, reaching US$449 million. In the first 10 months of 2017, two-way trade has already reached about $630 million, up 80 per cent against the same period last year, making Slovakia one of the most important trade partners of Việt Nam in the Central and East Europe regions. Việt Nam’s primary exports to Slovakia include footwear, clothing, seafood, industrial machines, and electronics while the country mostly imports mechanical products, chemicals, and pharmaceuticals. Speaking at the event, Slovak Deputy Prime Minister Peter Pellegrini said trade opportunities between the two countries remain significant but reality has not yet match potential. He also said Slovakian businesses have expressed interest in investing in Việt Nam in mechanical engineering, energy, construction materials, and environmental works. Currently, Slovakia is investing into nine projects in Việt Nam with total capital of $247 million, making it 36th of 128 countries investing directly into Việt Nam. On the other side, Việt Nam has only one ongoing project in Slovakia by the FPT corporation with total investment of $447,000, in addition, TH True Milk is also exploring investing in projects concerning herbal drinks. 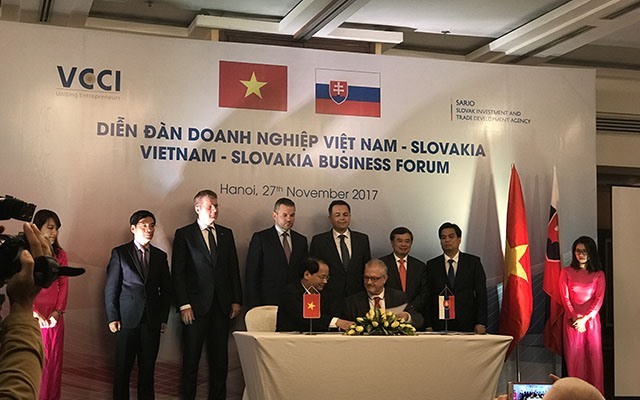 “We are ready to support Việt Nam and make Slovakia a gateway for Việt Nam to access the EU market,” he said, adding that the Slovakian government is committed to making ideal conditions for Vietnamese businesses investing in Slovakia.